• For use with 18 through 150 pound HellermannTyton cable ties. • Extremely durable adhesive achieves high pull-off force and is unaffected by vibration. 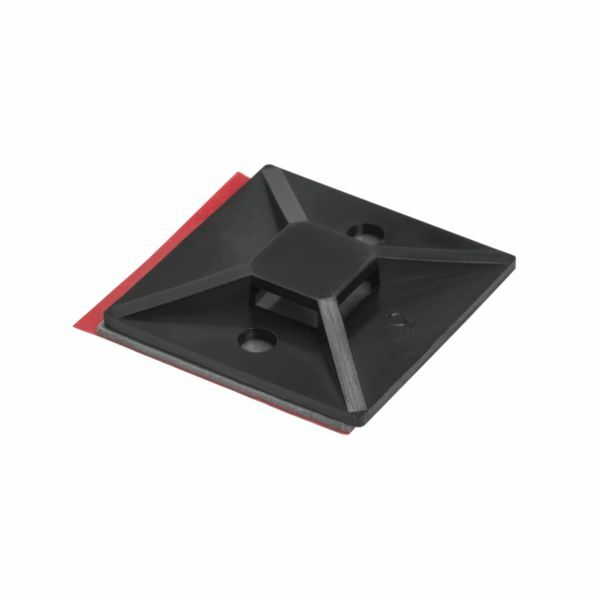 • Multiple sizes accommodate a range of cable ties. • 4-way opening allows cable ties to be installed parallel or perpendicular to wire bundles. • Predrilled holes extend mounting options and security. • Mount made of proprietary, impact-modified PA66 material for extraordinary durability, and is heat stabilized and UV resistant for extended life outdoors. • Peel and stick for quick, convenient use in extreme-duty applications. • For use with 18 through 150 pound HellermannTyton cable ties. • Extremely durable adhesive achieves high pull-off force and is unaffected by vibration. • Multiple sizes accommodate a range of cable ties. • 4-way opening allows cable ties to be installed parallel or perpendicular to wire bundles. • Predrilled holes extend mounting options and security. • Mount made of proprietary, impact-modified PA66 material for extraordinary durability, and is heat stabilized and UV resistant for extended life outdoors. • Peel and stick for quick, convenient use in extreme-duty applications. HellermannTyton offers adhesive mounts in a variety of sizes to match your cable tie size and extreme-duty application needs. The mount features 3M™ VHB™ (Very High Bond) adhesive, which actually builds strength over time and holds securely to difficult materials such as aluminum, steel, plastics and painted and powder-coated surfaces.